Ready for Takeoff: Each year, an airport springs into existence in the desert [top]. Charles Petrie [bottom] has helped it scale dramatically. as the 70,000-strong end-of-summer experimental arts festival in Nevada’s Black Rock Desert. Lesser known is its FAA-designated airport. 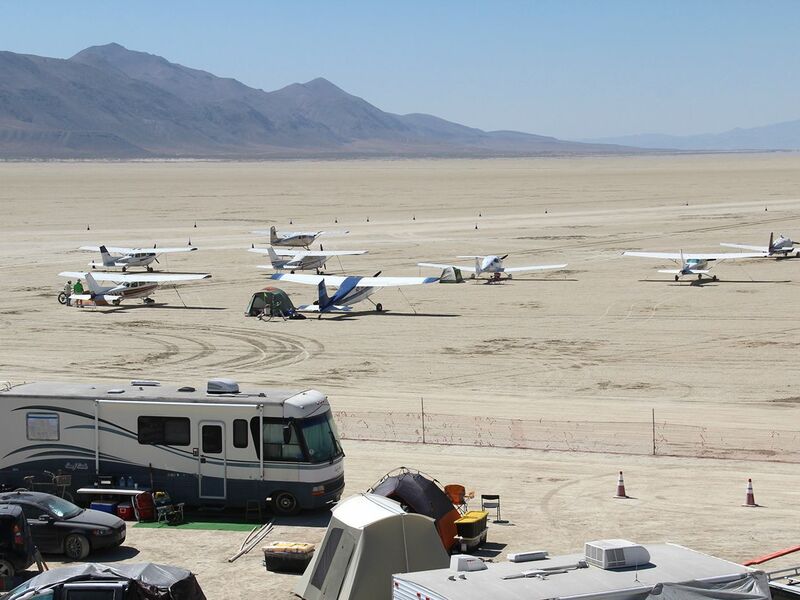 The Black Rock City Municipal Airport springs up each year to coordinate nearly 3,700 general aviation, chartered, and scenic flights carrying some 6,000 passengers in and out of the gate. It’s been nearly two decades since the airport, founded in 1999 by pilot Lissa Shoun, began as a single dusty landing strip handling tens of flights. Computer engineer Charles Petrie was instrumental in transforming it into Nevada’s third busiest airport (behind Las Vegas’s McCarran and Reno-Tahoe airports) during 7 of its 13 operating days. Petrie is notoriously accident-prone, with repeated injuries earning him the nickname “Calamity.” “I’m the only person who’s ever been medevaced twice from Burning Man!” he says with a laugh. Petrie joined Shoun when she started the airport in 1999 and played an increasingly important role. Over the years, they developed progressively complex operating and safety manuals, and Petrie designed an accompanying software system to track flights and passengers, as well as rogue charter flights and fence jumpers. When Petrie took over as airport manager after the 2012 festival, he and his team streamlined the chains of command for its 400 volunteers and instituted more stringent rules and systems—including special tests and briefings for pilots flying in the playa’s mercurial winds as well as ways to catch and penalize trespassers. In 2016, Petrie and his team boosted passenger capacity by convincing Burning Man to hire an umbrella company to fly larger planes and oversee the 17 individual charter companies that make up the event’s Burner Express Air, which shuttles burners from six midsize airports in California and Nevada. The goal is to enable the airport to eventually handle 5,000 attendees to reduce the extreme road traffic to Burning Man, says Petrie. “My whole theory of project management is, you don’t have a plan, you have ‘dependencies.’ When something changes, you find out what else changes. It’s a propagation-of-change model. I’m constantly touching base with everyone, making sure everything gets done,” says Petrie. Approaching his 21st burn, Petrie is slowing down, having transferred command of the airport to its former logistics manager, Meg Kosowski. But he’ll still be there in the desert, serving as an on-site mentor.